South Africa Powerball is one of the biggest and most popular lotteries in not just South Africa but also all of Africa. Although its jackpots aren’t anywhere as crazy as the US Powerball lottery that it’s based on, South Africa Powerball offers much better odds, much lower ticket prices, and very decent prizes spread over a generous nine tiers. In addition, its R3 million (€195,000) minimum jackpot could go a long way to changing a lucky winner’s life for the better. 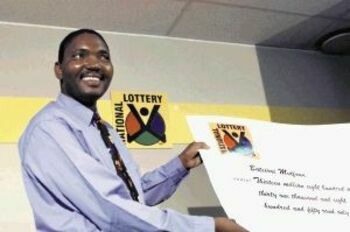 As far as lotteries go, South Africa Powerball is pretty young, only coming onto the scene in October 2009. Introduced by the South Africa National Lottery and regulated by the National Lottery Commission, this game soon surpassed South Africa’s other tremendously popular lottery, South Africa Lotto. Its first jackpot win was R30 million (€2 million), and the jackpots increased in size ever since, setting new national records and turning many people into instant millionaires in the process. No wonder that 82% of South Africans play lotteries on a regular basis! At the end of November 2015, the operators announced several major changes that made the game even more popular. These changes included the Powerball Plus secondary draw (more on this below), a ninth prize tier that greatly improved the overall odds of winning a prize, and a ticket price increase to R5 (€0.33)—which some people weren’t happy about until they saw how much bigger the jackpots got as a result. Of the money that is generated through ticket sales, 34% goes to a number of different causes around the country that significantly improve people’s lives, including various development initiatives. The South Africa Powerball game format is a double matrix similar to that of its American cousin, but the total number of balls in the main and secondary drums is quite a bit less: 45 and 20. To win the jackpot, players must correctly match the 5 balls drawn from the first drum and 1 ball (the “Powerball”) drawn from the second drum. An interesting thing about this game is that although it has no limit on rollovers, they only apply to the jackpot prize. If no one wins a secondary prize, it rolls down to the next tier—meaning that you could potentially win some great prizes despite not matching as many balls as you normally would need to. Another feature worth mentioning is that for just for a little bit extra, you can enter the Powerball Plus draw. This is a secondary and supplementary draw that takes place right after the primary draw and gives your numbers a second shot at winning you a great prize. Although you will be playing the same numbers and the odds of winning the different prize tiers are the same, the prizes aren’t quite as good as those in the primary draw. Nevertheless, for the R2.50 price of admission, this is well worth it. The chances of winning the South Africa Powerball jackpot might not be the best, but at 1 in 24,435,180 they are far from terrible. Compare them to the US Powerball odds, which are 1 in 292,201,338—about 12 times worse—and they actually seem pretty good. Just don’t forget that the US Powerball jackpot size is sometimes more than 100 times bigger. Nevertheless, South Africa Powerball’s odds are considerably better than several other major lotteries, including Mega Millions (1 in 302,575,350), UK Lotto (1 in 45,057,474), and Swiss Lotto (1 in 31,474,716). 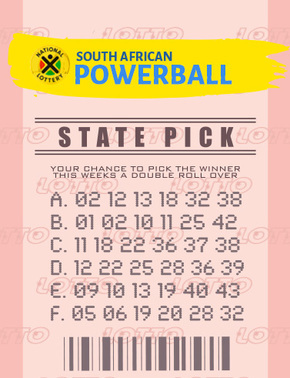 They’re a little bit tougher than South Africa Lotto (1 in 20,358,520), but considering that you can win a prize for matching nothing but the Powerball number and that the overall odds of winning any prize are 1 in 18, it still has a lot going for itself. However, they are quite a bit tougher than Canada Lotto 6/49 (1 in 13,983,816), which offers much bigger jackpots, and Hungary Hatoslottó (1 in 8,145,060), which offers similar jackpots. This national lottery stirs up a lot of excitement twice each week, as its draws take place at 9 pm SAST on Tuesdays and Thursdays in Sandton, Johannesburg, South Africa. The Powerball Plus draw occurs immediately after, and the results for both are made available the next morning. In the relatively short time that the game has been around, South Africa Powerball has offered some great jackpots. Since jackpots comprise 42% of the entire prize pool, unlike the 18% offered by South Africa Lotto, it comes as no surprise that this game is as popular as it is. Furthermore, 90% of all of the jackpots have been won by individual players who got to enjoy the windfalls all to themselves. *An interesting titbit about the 2011 win is that no one ever actually claimed it—can you believe it? All South Africa Powerball prizes—all the way from the top to the bottom tiers—are paid out in cash as a lump sum. There is no annual payment option with this lottery. All winnings are tax-free, meaning you’ll get every last rand that’s owed to you. However, depending on what your home country’s tax policy on lottery wins is, you could still be taxed once you transfer the money into your bank account. That’s why it’s always best to check your local and national tax laws, as it’s the best way to prevent any unpleasant surprises later on. If you’re wondering if you can play South Africa Powerball online even though you live in a different country, we have good news: yes, you can! Many of the top lotto websites offer this game as an option so that you can play regardless of where you reside. In addition, these sites can increase your chances of winning through subscriptions, lottery syndicates, and other great features that official lotteries typically don’t offer. Just keep in mind that ticket sales through lotto agents usually end about three hours before the official ticket sales end. South Africa Powerball – Is It Worth Playing? When you factor in the decent odds, solid prizes, and Powerball Plus game—not to mention the very cheap ticket prices—South Africa Powerball is definitely worth playing. Despite its jackpots being much smaller than those of its American counterpart, this is still a great lotto overall that has managed to capture the hearts of millions of regular players within South Africa’s borders and beyond. SA Powerball is one of my favourite lotteries! Been playing since the day it was first introduce and won't stop anytime soon even though I now play other country games too. Very good game IMO.